The Shore Holiday Apartments offer self-contained one bedroom apartments with fully equipped kitchens. In your kitchen you’ll find all the essentials including a fridge, stove, microwave, kettle, crockery, etc. 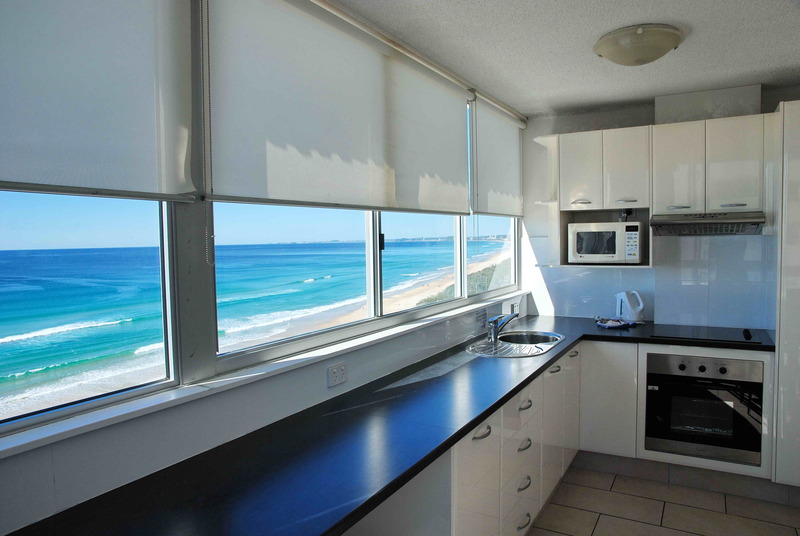 Staying in a Surfers Paradise holiday apartment means that you’ll have the choice of dining out at one of the many fantastic cafes, restaurants, eateries or take-away establishments on the Gold Coast, or save some money and enjoy the convenience of preparing your own meals in your apartment. There are supermarkets including Coles and Woolworths in Surfers Paradise, so you can stock-up for your stay – or just grab some of the essentials at the nearby convenience store. There is also a fishermans co-op just a short drive away in Main Beach – perfect for getting fresh seafood straight from the trawlers. The Shore Holiday Apartments also have BBQ facilities on-site, why not enjoy a relaxed barbecue at the end of a long day sightseeing or surfing across the road at the beach! Take a look at our Gold Coast apartment features and book your next Surfers Paradise holiday today!